We provide products that exceed customers' expectations! 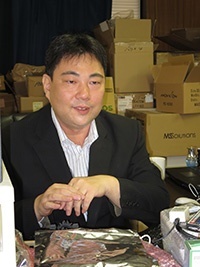 Mr. Nakamura launched Moveon, an electronic hardware manufacturing company, in 2007. Since then, the company has been manufacturing GPS navigation devices and portable chargers for mobile devices. The number of Mimaki products in the company has gradually increased as the business has expanded. 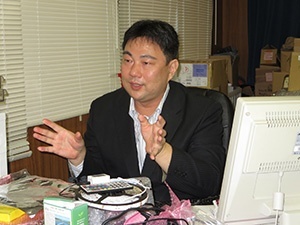 Mr. Nakamura talked to us about the history of the company and why he chose Mimaki products. I founded the company in 2007, and the first product was a simple portable navigation device (PND) because I had previous experience in product planning for automotive music and GPS navigation systems. After launching the PND, I was searching for ways to distinguish our PND from those of our competitors. I received inspiration from the trekking craze in Japan. In 2009, we developed a new portable GPS system YAMA-NAVI for trekkers and mountain climbers. This product was featured on TV shows and became popular; however, its use was limited due to its short battery life. Climbers typically stay in the mountains for two or three days without any power supply. 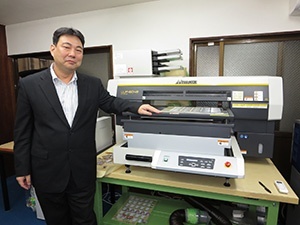 Mr. Nakamura says that Mimaki UJF-3042HG allows the creation of differentiated products. During the period of transition from feature phones to smartphones, the number of smartphone users rapidly increased. 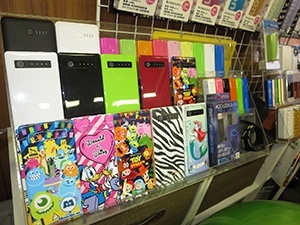 Accordingly, the smartphone accessory market also became very active. Thus, I decided to sell smartphone cases; however, our company cannot compete in the smartphone accessory market if we cannot offer a differentiated product or service. Thus, we started Skepi, a quick, custom printing service in 2013. Before launching Skepi, we had to shift the print production base from China to Japan in order to manage the production processes for realizing quality printing and fast delivery. UJF-3042HG is capable of high-speed printing onto various smartphone cases, and no minimum order quantity is required; thus, the UJF-3042HG was chosen for Skepi. As expected, Skepi has been satisfying the needs of various customers and has received positive feedback. Through the Skepi service, we started doing business with mass retailers. On the sales floor, we had to describe the details of the Skepi custom printing service. Instead of employing a salesperson, we utilized a JV33-160 solvent inkjet printer to create a promotional sign board to visually explain the Skepi service. This sign board expanded our business; a person working in the decoration department of the store admired the board and hired us to create a similar product. The JV33-160 has been used for a wide range of applications in addition to the in-house promotional board. JFX200-2513 is used for making in-store decorations for mass retailers. We also installed a large flatbed UV inkjet printer (JFX200-2513). Due to its high print accuracy, the print positions are not misaligned, which is useful for double-sided printing on transparent materials. Previously, double-sided signage was created by pasting two prints; however, this required time and special techniques. 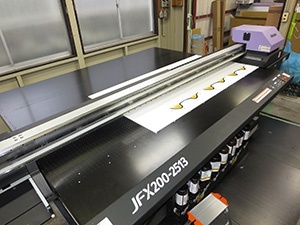 The JFX200-2513 is the best solution for the production of transparent, double-sided signs. One mass retailer needed to elevate their brand value, and we successfully provided decorations and prints to satisfy their needs. Mimaki products are capable of producing high-quality prints that enhance the value of sales floors. The Kongsberg XN is capable of cutting thick and rigid materials. 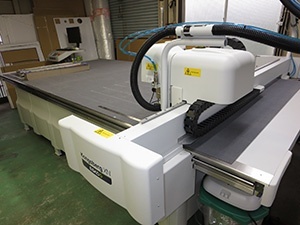 To meet the needs of various customers, we installed a Kongsberg XN cutting plotter that can cut rigid and thick materials such as Re-board or honeycomb board. These light and durable materials are widely used for signage as well as in construction applications. We believe that the XN broadens the scope of our business. UJF-3042HG has brought added value to Move-on products. We have been using the UJF-3042HG printer for printing smartphone cases. However, new print orders for cartoon characters have increased (e.g., requests to print characters on key chains or similar items). We rediscovered the advantages of the UJF-3042HG through these new orders. The first advantage is the printing speed; character-printing orders tend to require a short delivery time. For example, one order received in the morning needed to be shipped out in the evening. A different order required us to print tens of thousands of items in one week. The UJF-3042HG is always able to accomplish these orders with extraordinarily fast turn-around times. Simultaneous white and color printing capability is the strongest advantage of this printer because the printers of competitors cannot achieve it. Higher product durability is required to handle large amounts of printing orders. Our maximum production volume is seventy thousand items per month; if the printer stops operating, our customers might incur significant delays. Thanks to the reliable Mimaki products and fast technical service, we can take large-volume orders without hesitation. We are also satisfied with the running cost and print quality provided by Mimaki products. Although printing quality has the lowest priority, we have not sacrificed printing quality. Nowadays, good print quality is not an unusual feature. We have absolute trust in the quality of Mimaki printers, which are supported by reliable technology and a robust technical service system. Therefore, we do not have to pay close attention to the printing quality. In my previous work, I focused only on product design because the manufacturing lines were in China or Korea. Now, I am able to see some of the manufacturing processes, and I sometimes use the printer to help employees when they are busy. Although I cannot hold a candle to a real craftsman, I find delight in manufacturing through the printing process. We will continuously produce unique products that are differentiated from those of our competitors and increase our investment in equipment including inkjet printers, cutting plotters, and 3D printers to achieve a complete internal manufacturing system. I always want to impress customers by providing products that exceed their expectations. In order to achieve that aim, I would like to work closely with Mimaki staff and effectively use Mimaki products. 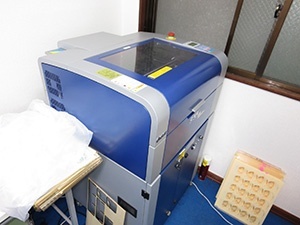 A laser cutter is also used before or after inkjet printing by UJF-3042HG or other Mimaki printers in goods manufacturing processes. 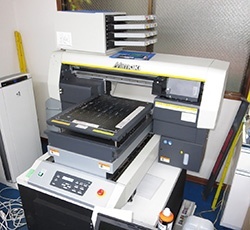 A UJF-6042 printer that was recently installed to meet increased orders.